Recently I made a comment about my horror at seeing people buy conventional dishwasher detergent, but I realize I haven't even written a post about what better options there are. Conventional brands of dishwasher detergent contain phosphates, which can cause algae blooms in lakes and ponds that can suffocate plants and animals that live in those bodies of water. Conventional options may also contain chlorine, which the production and use of creates toxins which are dangerous for people and the environment. Standard dishwasher detergent may also contain ingredients derived from petroleum. I did a search online and found some information on Grist about phosphates. The article even mentions that Washington State has recently signed a new bill that will keep the phosphorus content in dishwashing detergent to 0.5 percent beginning in 2010 (a big improvement). There are many eco-brands which offer safe dishwasher detergent. I've tried Biokleen, Seventh Generation, Ecover, and even Trader Joe's. For my machine it does seem to help if I use a rinse aid. 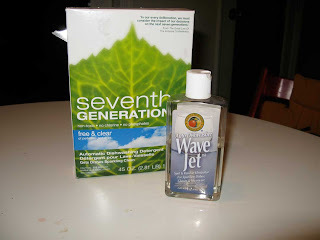 I have found one called "Wave Jet" from Earth Friendly Products. I've also read that you can use a few teaspoons of baking soda for the same effect. Shaklee makes a great detergent! I love it and I've used several!!! Use vinegar in your rinse aid dispenser. Works like a charm and is cheap! Hello, I absolutely LOVE your blog. I actually use Diamond Brite. It's wonderful! It uses a combination of natural cleansers without environment spoiling phosphates or potentially toxic chlorine. It's super concentrated and costs less than 7th Generation. Have a wonderful day! I just bought Seventh Generation, seems to work well. I switched to bio-dishwasher detergent when I couldn't stand the smell of scent and chlorine being dumped into my kitchen every night. I tried Ecover tablets first and I like the way my dishes come out. I am not sure why, but my dishes actually look better than when I was using conventional products (shiney-er). The only downfall is the Ecover does not get tea stains out of the cups...a minor irritation for me, but it may not be acceptable to some. Palmolive (sp?) just came out with a mass market phosphate free dishwasher gel. We just bought some and will let you know how it works. To me it's SUCH a frustration that companies continue to use these ingredients that are KNOWN to hurt aquatic life...but that can be said about SO MANY things - it's really disgusting that people/companies seem to not care or not have a conscience...You know??? I know there are alot of uninformed people out there but it seems that many know and don't care...but companies KNOW and they continue to use all of these nasty ingredients that are hurting us, animals, the environment, etc. etc. Sorry went off on that but it's so frustrating! Great blog! @ Cheryl: Regarding tea stains, I scrub my cups out with baking soda before putting them in the dishwasher. Gets almost any tea/coffee stain out (and I've had some pretty ugly, long-sitting stains finally delivered to my sink!). I use Diamond Brite and it is by far the best dishwasher detergent I have ever used. No grit, no hard water stains and dishes come out dry. You don't even need a rinse aid this stuff works so well!